Population aging is changing societies on a global level. Our current models have fallen short in addressing both challenges and opportunities presented by this demographic shift. Governments and organizations need new implementable models to address the accompanying wave of change. Globally, active aging is recognized as part of the solution.1 Why? Research shows that an active lifestyle can lessen the challenges and increase the opportunities associated with population aging.3 Active aging provides environments, programs and places that support individuals in living well and taking charge of their health and wellness. 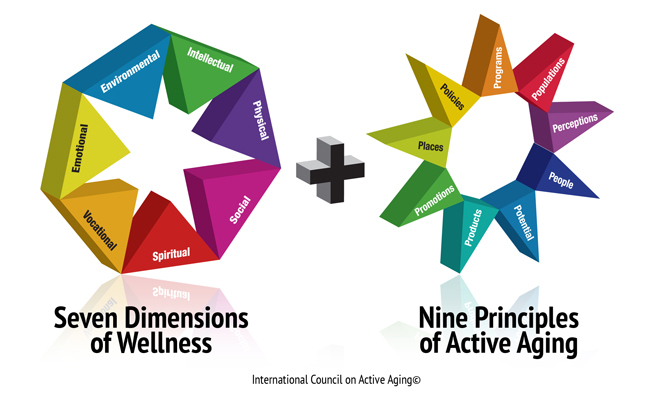 The International Council on Active Aging® (ICAA) has created Nine Principles of Active Aging, a model to guide governments, product and service providers, employers, and the healthcare industry in how they respond to population aging. By implementing and operating by these guiding principles, organizations and agencies will be able to build a foundation for their efforts and encourage active, engaged living for people of all ages. It is also essential, when implementing the nine principles, to incorporate the seven dimensions of wellness into each principle. This integration is the “spine,” or support structure, of the ICAA Model and is crucial to meeting the needs, capabilities, expectations, dreams and desires of the older consumer. To access references, click here.